Welcome to Fly London Shoes – your best resource for the brand online. Here we are not only going to show you where to buy the shoes for the cheapest prices. We will also show you where you can watch product review videos and more. For example; see the current marketing campaigns and all sorts of other information you need before buying your Fly London Shoes. So let’s start with a little about the brand. Back in the late 80’s clothing shops didn’t really sell shoes. This was the preserve of huge shoe chains like Dolcis, Ravel, Saxone and Barratts. These are the kind of shops that fashionable Women would frequent to get the best quality shoes. The best source for these products was Italy or Portugal. This was a time when Eastern Europe hadn’t really opened up. Noted for its cheap plastic footwear and basic leather pumps China was not fully developed. There is, of course, a vast collection of wedge shoes in a variety of colours. This illustrates the types of fly shoes available so that you can start your very own search for the best prices. To get you started we have provided some useful links below in the order of price. Not everything is carried in these stores so you may well have to visit a few to find out what you want. 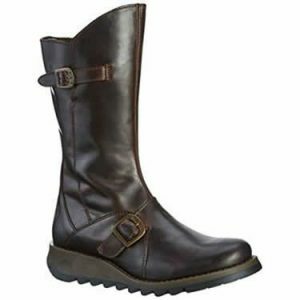 The company sells an enormous collection of Fly Boots – we will talk about them in more detail on that page. Where Can I Buy Fly London Shoes? There are many stores online where you can buy the brand. What we have tried to do here is to list the ones where you will get the best value. Amazon is a huge resource when it comes to buying online and their collections are generally larger than anyone else’s. They are also fiercely competitive. They don’t have everything but it might be worth checking them out first. Operating from the town of Guimaraes in Northern Portugal on of the factories was Kyaia, a family run company. Noted for its shoemaking abilities the town supplied most of the footwear trade in the UK. By the mid 90’s competition was starting to creep in from India, China of course and Eastern Europe. Places like Czechoslovakia, Bosnia and Turkey. Cheaper imports were coming in from China causing Kyaia a problem. The solution was to start a brand themselves. This they did with the help of two English guys. Agent David Conibere and Designer Perry King. With round throats, the court shoes come in interesting patchwork leather Black leather for work and wet look patent with a slight crinkle effect on the surface. He developed wooden wedge heels too and later used some of these ideas in the formulation of Hard Hearted Harlot with his wife Carol. You can see some of the styling similarities between the two shoe brands. Forward twenty years and Fly London Shoes are still one of the biggest successes in the Portuguese shoe market. Sold all over the world, the brand is available in far off places like the USA, Taiwan and yes, even into China. One of the 21st centuries major successes, the company continues to thrive. Probably the most popular section in terms of sales, the biggest selling part of their collection is the ‘Yellow’ sole which is the 48mm high wedge sole with lines along the side and the platform on the front. The styles are pretty varied including some stylish work type shoes like Pump and Yoni – round throat courts that you can dress up and down. There is the new Hya which has a feature hole though the centre of the sole. Sandalised shoes like Yone which comes in soft nubuck and a variety of colours. Finally, there is the haute-couture kind of sole, the Kat which is a high wooded wedge that you wouldn’t see everywhere, so you’d need to look around online to buy them. Not really noted for their flat shoes the brand has a limited selection but frankly they are not the best sellers. Fans of the footwear prefer the iconic wedges rather than simple flat shoes that they can buy from anywhere. There are a few exceptions though. You can find the trainer lines on the Stripes sole and some of the thicker soles with more character can be found in certain boutiques and also online. One of Fly London’s oldest trainer is similar to the Fly Shoe Terra and has been in the collection for many years. These shoes come in leather, nubuck and soft grain leather. Here are some examples which you can buy now. 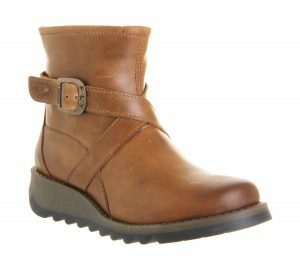 When it comes to high grade leather boots nothing can beat the unique design and creativity of Fly London Boots. 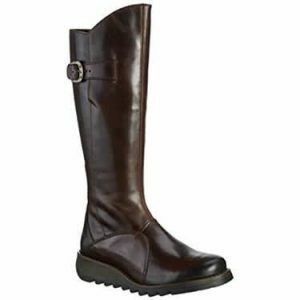 From the very beginning, over twenty years ago they developed a core line of well made, well priced designer boots. One of the reasons they have become so successful. The ethos is not to throw the old designs away, but rather to evolve and morph them through the years. It is one of the reasons you continue to see styles like Mol and Mes in the collections. Slowly moving these designs forward from the original stitch-down soles to the cemented soles of Mol 2 and Mes 2. I suppose it would have been easy just to start afresh each season but to be successful you need to maintain brand identity. This is what Fly Boots have managed to do season after season so well. What are Fly London Boots made from? One of the materials the brand uses extensively throughout their boot collections is ‘rug leather’. So what is it? Buffed to reveal the nap underneath it is a type of high quality calf leather. Lightly mopped with a light oil, the surface is then burnished to give the two tone look of the material. You can see the effect on the boots in the large image above. Burnishing means that the whole boot has been pushed against a rotating mop which turn at very high speed. At this stage more wax is added and the effect of the heat generated by the wheel darkens the leather. This results in products where no two boots are the same but of course the factory will match individual pairs! The linings of these boots can be pig leather but more often that not these days it is a light, hard wearing, printed microfibre. It is really important to provide a high level of comfort and the fabric is light and supple, matching the natural contours of the foot and the upper. Similar to Fly London Shoes the company often uses the same soles across the ranges. We will detail some of the collections below by boot type but note that within these types of boots there are common soles. For example the ‘Yellow’ sole turn up in all categories being available in all the types of products you can buy from Fly. One of the biggest selling areas for the brand because they sell virtually all year round. Selling early on in the season from July right up to, and after Christmas. Fly London Ankle boots fall into three distinct areas. 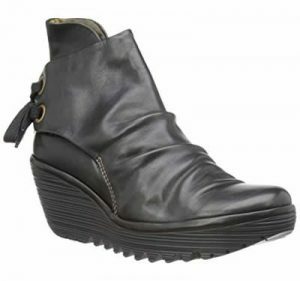 Fly Wedge Ankle Boots, Heeled Boots and Flats. The most popular are the wedges which are also used on the fly shoes and fly sandals collections. 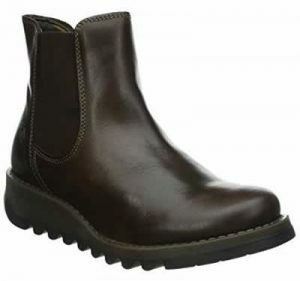 Note when looking at any of the above boots there are many colours to choose These include black leather, tan leather, navy, red as well as a selection of nubucks and metallic materials like Fly Halp and Fly Yogi above. It really is a vast collection with straps, buckles and elastic features. 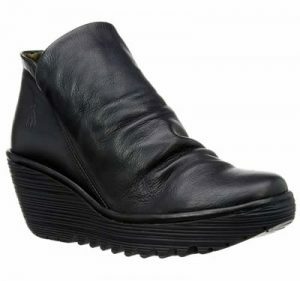 These are the best selling wedges but there are others so go and check them out! 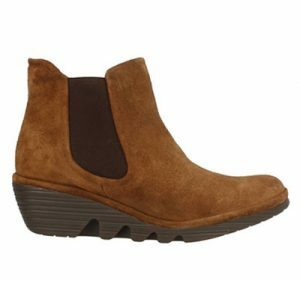 There are a number of Flatter ankle boots and those on blocky heels that the brand does quite well with. Some of the military designs also fall into this category. Often these boots are sold in distressed leathers. Also, there are a number of very low wedges which are all but flat also. These are in the rug leathers that we spoke about above. Take a look at some of the designs below. Once again, this is not the total collection but a scout around the some of the shop above will reveal more colours and variations. 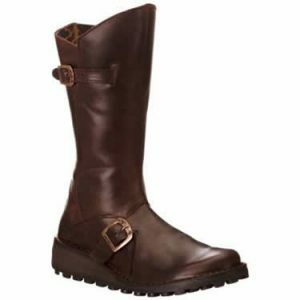 Here we find some of the best selling fly boots in the whole collection despite the fact that they are at much higher prices. Styles such as Fly Mes and Fly Mol have dominated the mid height collections for many years. 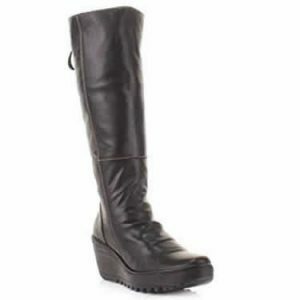 These are the Fly London Biker Boots that are so iconic and are core to any season’s range. Augmented by Mes 2 in 2013, Mes is the original version on the stitch down sole. Similarly, Mol is the higher twin strap version which was likewise added to with the release of Mol 2 in the same year. We haven’t listed every style here in every colour, safe to say there is a huge range of colours and materials available. We would urge you to check the outlets listed above, starting with Amazon as they are usually the cheapest. What is the difference between Fly London Mes and Mes 2, Mol and Mol 2? There is a difference between Mes and Mes 2 and it’s the same difference for the higher boot. Manufactured similar to a desert boot Mes is on a stitch down sole. You can see the stitching around the edge of the sole. When it comes to Mes 2, there is no stitching. Thicker than the original sole, it is cemented on. This goes for Mol as well. You will also find this sole on some of the ankle boots where we sell the original stitched sole as well as the stuck on version. The advantage of the cemented version is that it is ever so slightly more water resistant. No, no Fly Boot is waterproof. In order to achieve this, they would have to have a waterproof interlining and none of them does. Do not expect any of the above boots to act like wellies because they will not. wear them in the rain and snow only sparingly and then dry them naturally with newspaper inside if they get wet. You can find a lot of reviews online about the brand but they tend to be from shop and stores selling the brand. These resources tend to be rather biased because they want to sell you the product. These are the best resources. If you click on the text that says 218 customer reviews you will be presented with another page that gives you the details that all the willing customers have made about the products. No the good think about this is that they are honest and unbiased. You could never 100% trust a retailer with reviews on their own pages – you never really know whether they have written them themselves – we’re pointing no fingers! but with this huge store being so huge – no one is going to create fake reviews on here so you know you are reading exactly what the customer thought about the product! The good thing also is that reviews can be voted up and down so that the ones at the top are the ones voted as most valuable. We think these are the most honest and sensible reviews that you will read about the brand’s products. There are a couple of channels that come up regularly in search. One is our old friend from Shoes.co.uk – all of his old videos are still on YouTube so you can at least learn more about how the products are made. They are not current but they still contain vital information about the construction of the footwear and how they are made. You can visit that YouTube Channel Here. We really hope this page has helped you with your purchasing decision! How much are Fly London Shoes? 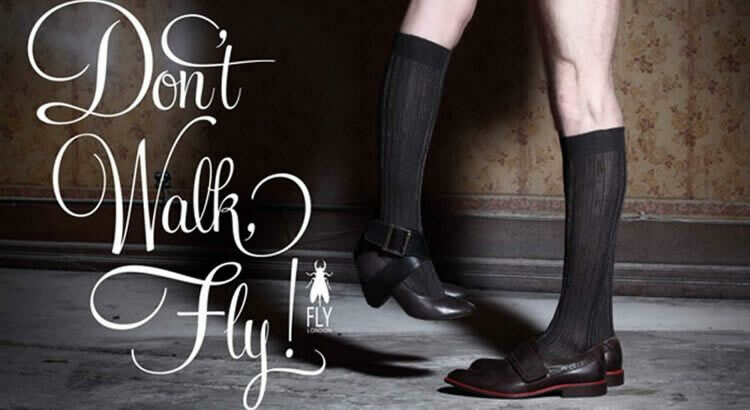 The Fly London range starts at £69.99 for the cheapest priced sandal and goes up to £150 for the highest priced boots. Sandals: £69.99 for the cheapest flat sandal to £105 for the most expensive thick soled wedge. Shoes: £49.99 for the cheapest textile shoe to £115 for the most expensive gold coloured Dwell shoe. 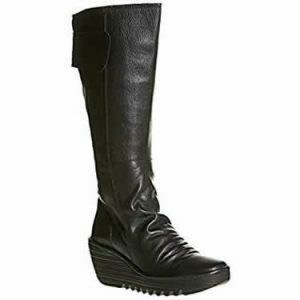 Boots: £99.99 for the cheapest flat boot to £150 for the most expensive knee-high boot. Cheaper prices are available from time to time throughout the year especially at sale times.